Canyon Lake, which is about 25 minutes north of New Braunfels, is one of the clearest and deepest lakes in Texas at over120' deep and it's great for all water recreation activities, including sailing and diving. It's small with around 80 miles of shoreline, but scenic with rolling hills (some of which are dotted with some beautiful homes), beautiful emerald green clear water, and lmestone bluffs. Canyon Lake is never as crowded as some of the other popular lakes. There are some small coves that are good for boarding or skiing and some excellent areas to drop an anchor and swim. The party cove will usually have 40 to 50 boats rafted up together and it's typically a good time. There are lots of ramps and plenty of lodging options but not directly on the water. This is a Corp of Engineers lake and boat docks are not allowed on the lake. The lake level fluctuates a lot but there is usually plenty of water to enjoy. If you're looking for a fun weekend or longer family getaway, then you need to call Yogi Bear's Jellystone Resort Hill Country. You'll find a variety of cabins that sleep 4 to 14 people. The cabins have a bathroom, AC, TV, porch, picnic table, and fire pit. 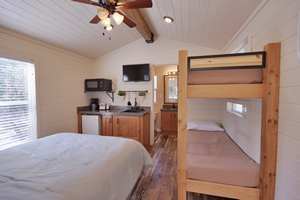 Some have lofts, queen and bunk beds, full kitchen or kitchenette, and lots more. As good as the cabins are, the Resort's amenities are even better. 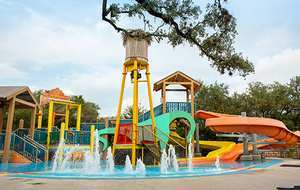 Kids will go crazy over the two pools, waterpark, pedal carts, disc golf, laser tag, volleyball, basketball, jumping pillow, and more plus several planned activities. You probably won't want to leave the Resort but if you do there are plenty of things nearby, some of which include: Greune Hall and Whitewater Amphitheater for live music, tube rentals including a shuttle to and from the Resort, fishing and boating on Canyon Lake, golf, and a safari park plus lots more. 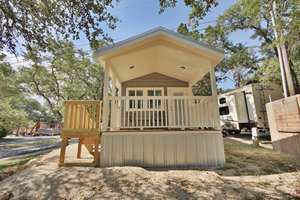 Read Texas Outside's review of Yogi Bear's Jellystone Resort Hill Country to learn why this is one of Texas Outside's Top Rated Texas Parks. .